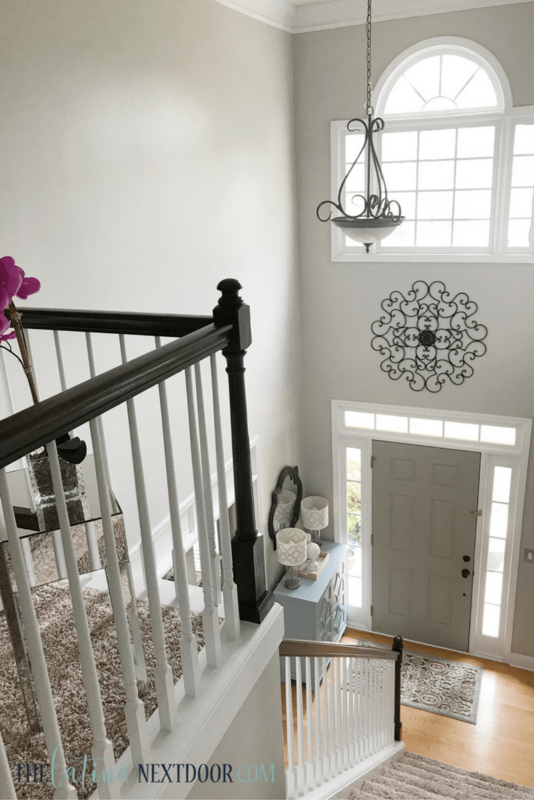 The foyer is the first thing your guests see when they enter your home and it is the first opportunity you have to create a welcoming atmosphere and showcase your style. 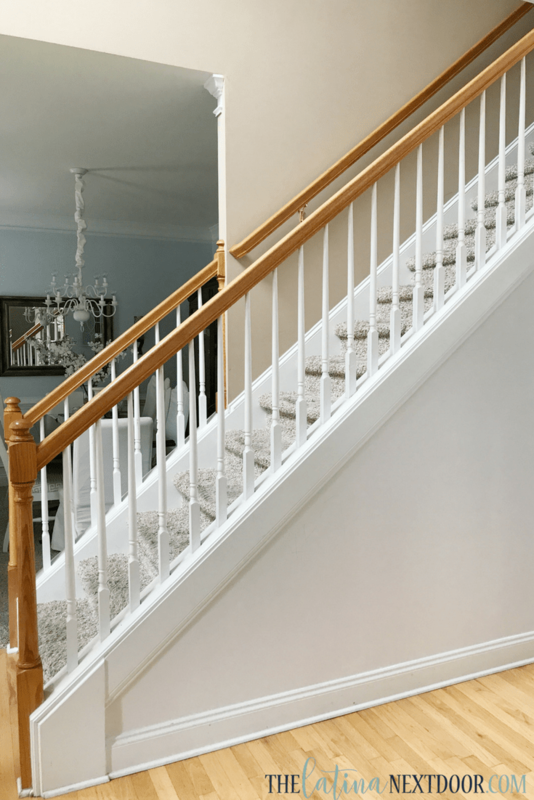 If you feel that your foyer doesn’t do either, there are several things you can try to achieve the look you want. As you saw in my previous post, our foyer was pretty dull and beige. 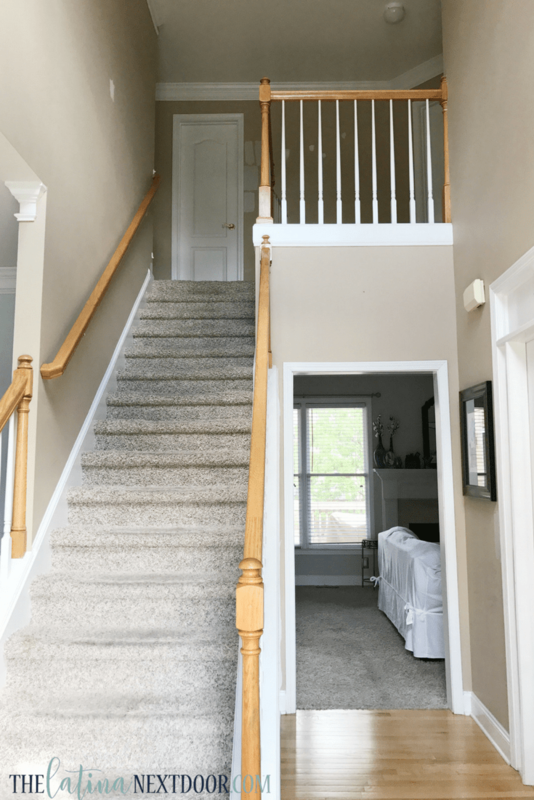 I knew I wanted something more updated and a bit more elegant so here is what we did step by step in order to update our foyer. We kept it simple, but it still made a HUGE difference and I share our tips along the way. The first step is to decide which color you wish to use. 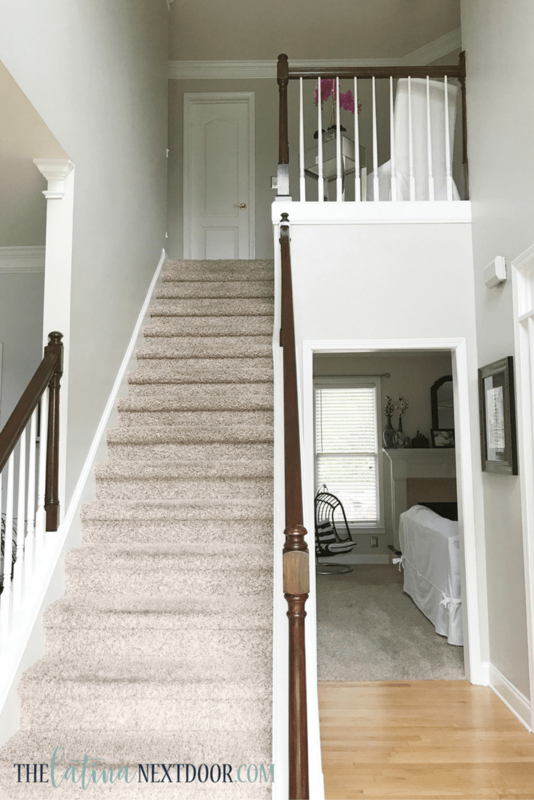 If you have a 2-story foyer, the best thing to do is keep it a neutral color, this way you can change out accessories and colorful décor without having to repaint 2-story walls to change your look. Purchase paint samples and apply them on your foyer walls to see how the colors look in your space. Tip: Place the samples in different areas –in shade, direct sunlight etc. By doing this you can see what the colors look like in different types of lighting. Prepare the space for painting. 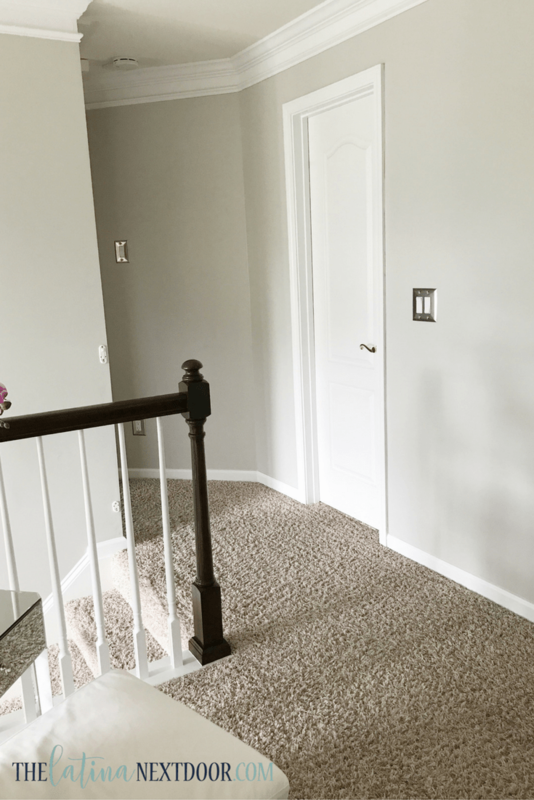 Remove all furniture, wall décor and switch plates from walls. Use a drill if necessary. Fill in any holes or indentations in the walls with spackle and sand down with a fine grit sandpaper until smooth. 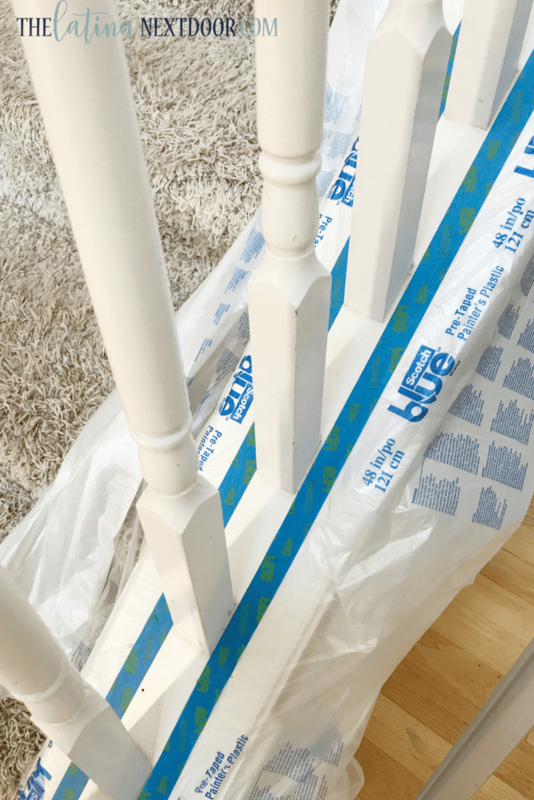 Clean your walls, then add painter’s tape and drop clothes or plastic covers to protect your floors. Cut in trim and other areas first and then paint your walls. 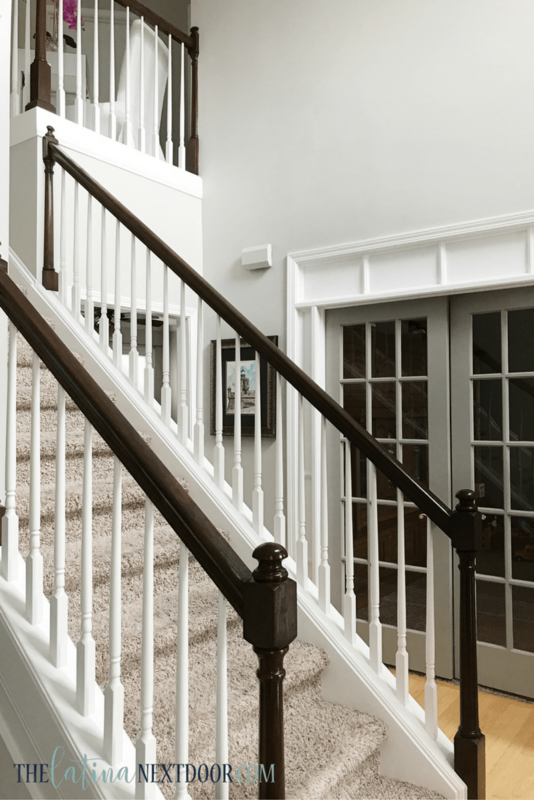 For 2-story foyers, use an expandable ladder that can be easily adjusted to the height of your ceiling in order to reach the top trim. 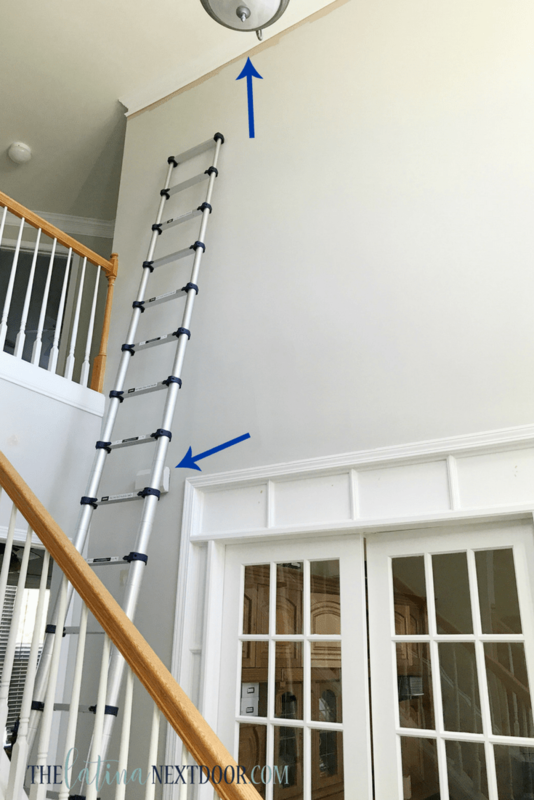 Expandable painting poles are also great at allowing your roller to reach farther up on high walls. Even if you are using paint with primer, always apply two coats of paint for an even finish. For high traffic areas, make sure to use a washable paint so that walls can be easily wiped down. I used Emerald Flat. Tip: Paint an additional coat to the area surrounding light switches, since these areas get a lot of action and need to get wiped down more often due to fingerprints. 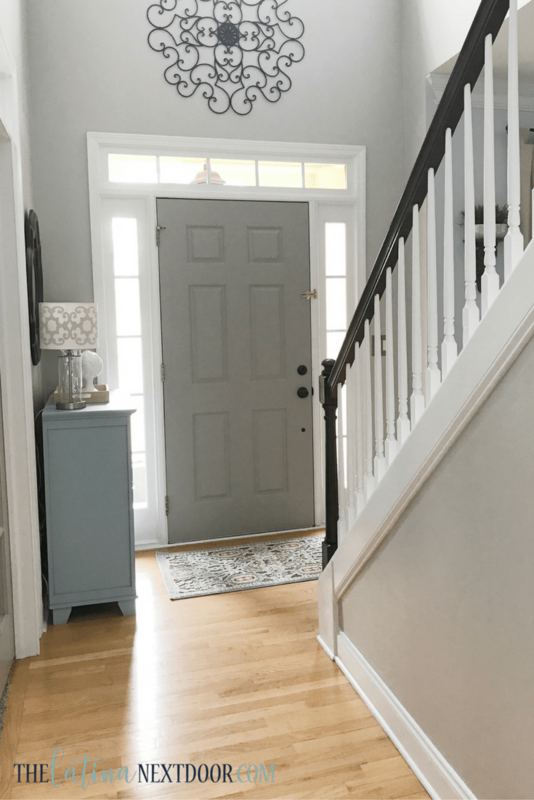 In addition, if your foyer has any unsightly but necessary features like large returns or doorbells, you can paint them the same color as the walls to minimize their appearance. 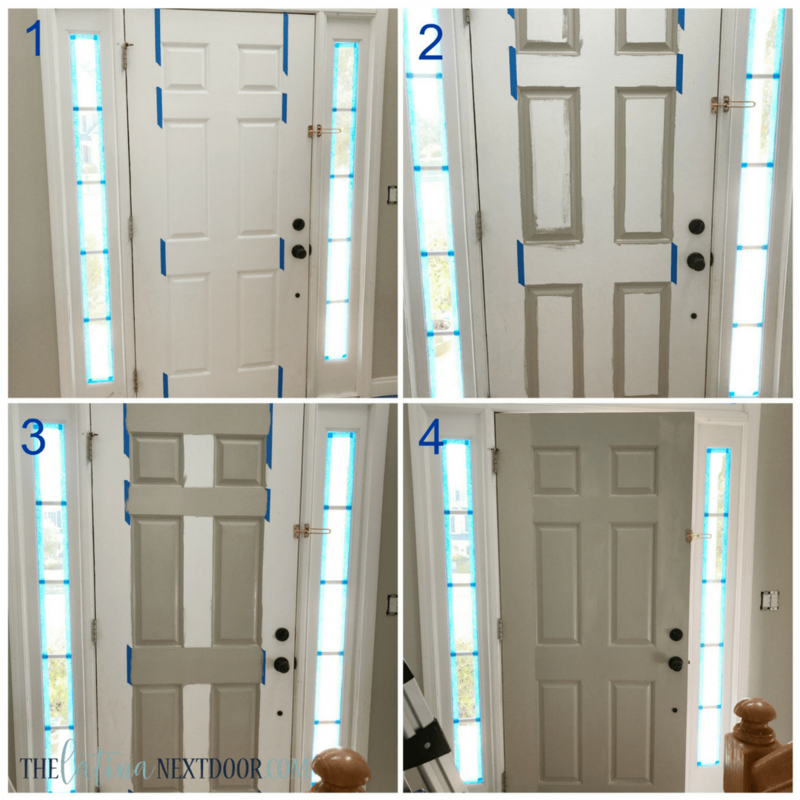 To add a little bit of drama, paint the inside of the front door a color other than white. 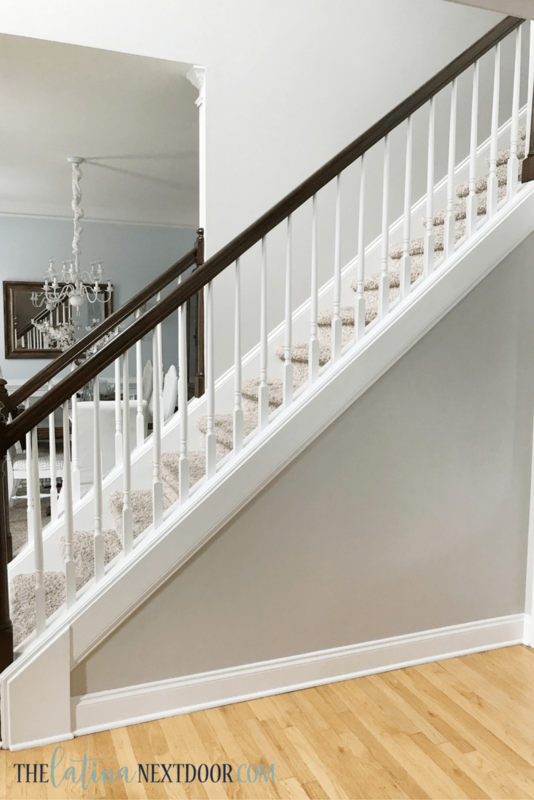 You can use this opportunity to use a bold color or you can simply use a color several shades darker than the wall color in order to add dimension. Make sure to go with the grain of the door panels. 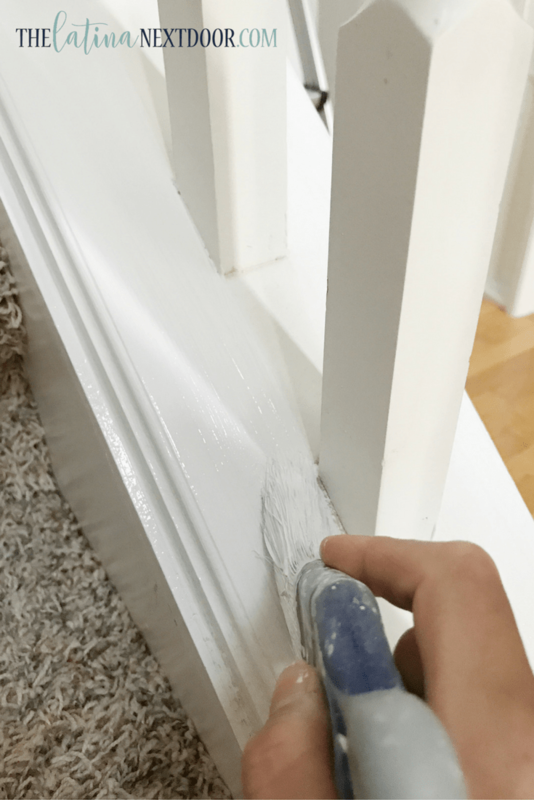 You can also use painter’s tape to prevent from going against the grain in some areas. Start with the recessed areas. Use a brush and paint in a clockwise motion to keep a consistent look. Then, with a small roller, go over the vertical raised panels. After applying paint with a small roller, smooth over with a brush and remember to go with the grain. Continue this process in small sections. Repeat the process until the door is complete. Then apply a second coat using the same steps. 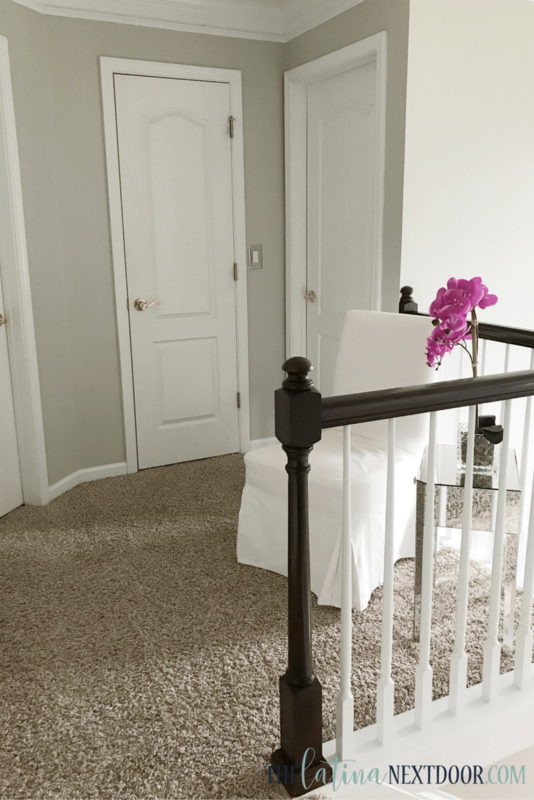 Another way to update the look of your foyer is by changing the stair railing color. 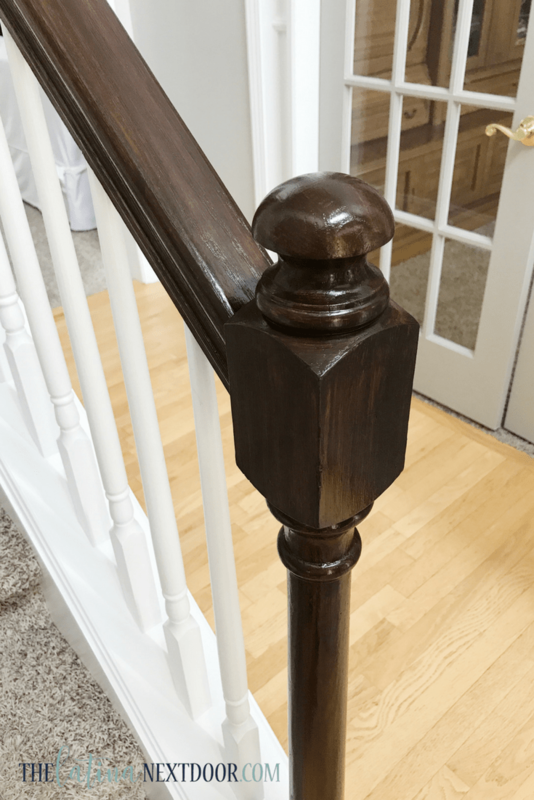 Oak is a popular builder’s grade finish and it is also found in older homes. 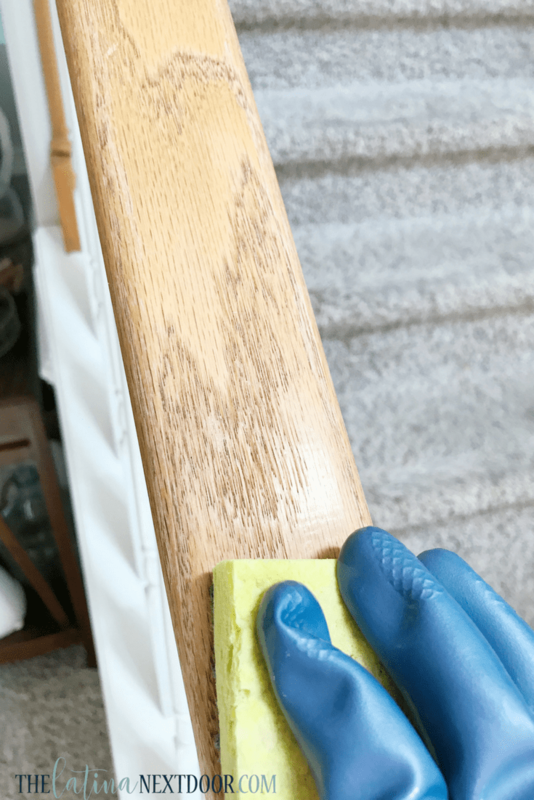 By applying gel stain in a darker shade, you can create a more custom and higher end look to your staircase without a ton of work. First, you must clean and prep the railings. You will need to sand them down to remove the finish, if you get to bare wood that’s even better. To remove any clear coat remaining you can use Simple Green Ready-To-Use Surface Prep Cleaner and the coarse side of a dishwashing sponge. Wipe them down with a damp cloth and let dry. 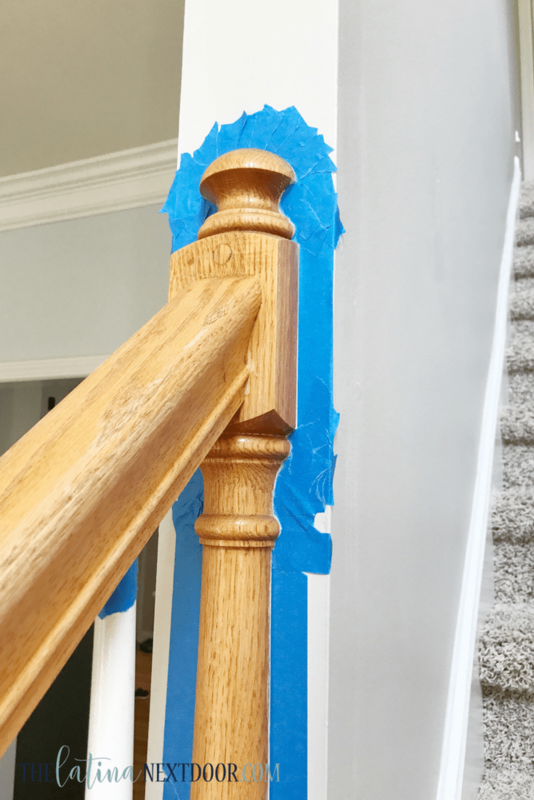 Then tape up all surrounding areas and balusters. Lay down plastic to protect carpet and wood. Mix the gel stain very well with a stir stick; you will notice it is a thick and gelatinous consistency so stir until the lumps go away. Make sure to wear gloves and apply the gel stain with an old soft cotton rag. Tip: Apply baby powder all over your hands in order to prevent excessive sweating and be able to easily remove and put gloves back on. 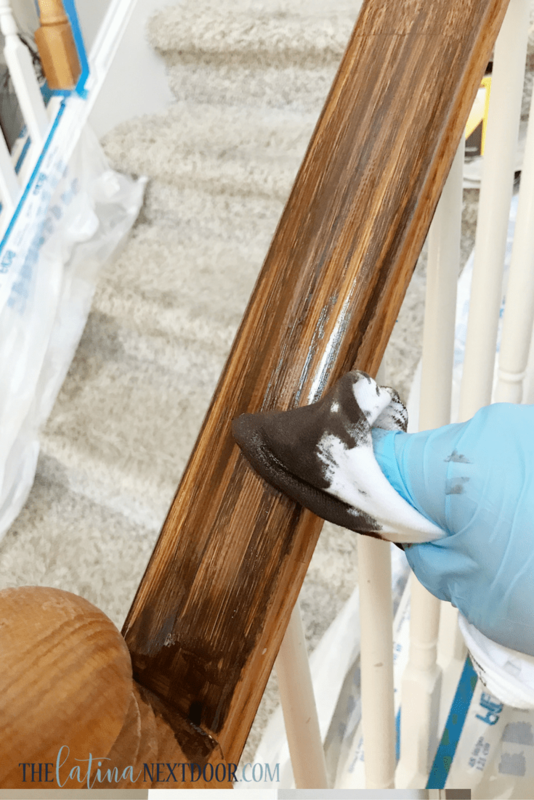 Make sure to move along with the grain of the wood when applying the gel stain and remove excess stain as you go. Work in long strokes in order to apply as evenly as possible. Let dry per the instructions and apply second and third coats until you get the look you desire. Finally apply a polyurethane coat to seal the gel stain and let it set. Once dry remove all painter’s tape and protection. Lastly, in order to pull everything together and finish up the space, repaint all trim and molding. Make sure to touch up all corners and crevices and any areas that might have had bleed-over from any stain or wall paint. Bring back furnishings and décor to complete your transformation. I love how the front door looks now with the darker color. I added an area rug with the colors of both the front door and the entry cabinet to pull it together. It feels so fresh and airy now. That hideous yellow doorbell is not as loud anymore since I painted it the same color as the walls. And I love how the french doors look. I still need to update the hardware, but it’s such an improvement already. Next up is finding a light fixture I like, cause that one has to go! And finally I need to add artwork to the walls. If you like this, don’t forget to pin it on Pinterest! Be back with more stuff soon! Stunning! I love the colors you chose, it definitely looks elegant. OMG, Yami! Your home is gorgeous! I’m so jelly! Great job! 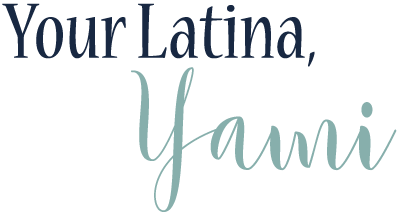 Bren Pace | Designs by Virtual Bren recently posted…What’s The One Thing that Girl Bosses Should Always Have? Boy what a huge difference that made! Fantastic job! I’m planning to redo my foyer in the Fall. This is giving me the motivation I need. You can do it girl! I know you can! Thank you Ola! You can do it girl, I know you can! Hello Yami, I love your home decoration ideas. It is very easy and in budget. It is a very lovable blog. I am also looking for same makeover. I will try your tips. Thanks for the lovely blog. Keep sharing! Hi, your foyer update looks great! I also love your accent cabinet, it’s the perfect shade of blue, not too dark nor bright. 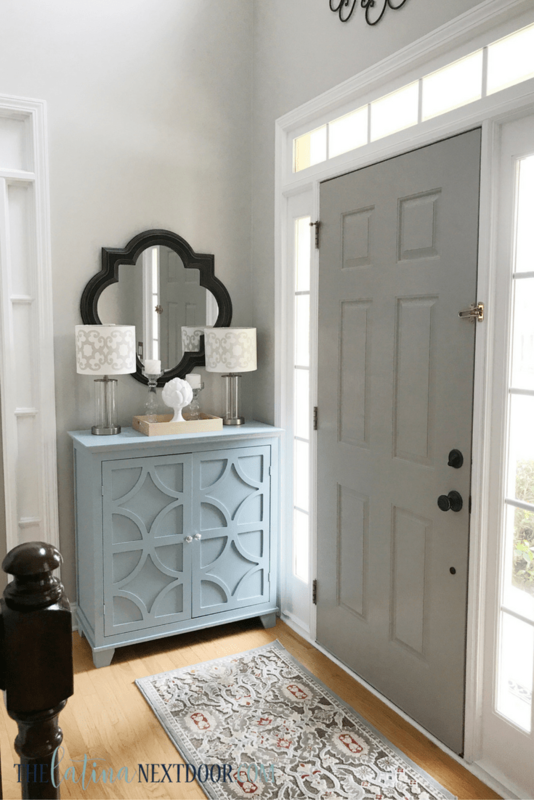 Where did you purchase the accent cabinet? Thank you! That was the foyer in my old home. I purchased the cabinet several years ago from Wayfair. It used to be black with plexiglass, but I replaced it with wood and painted it blue. Helo Brenda! We actually moved out of the house before I could do anything else. I have seen molding added throughout the wall and it looks stunning. Here is a video on YouTube that shows you what I mean (she talks about several tips, but she shows you her staircase in the video and what she did) https://youtu.be/bLCq0odMRlo > Also, you can create a gallery wall of pictures going up the staircase. You can make them large pieces of art or you can create a gallery of your family. Just be sure to keep the frame color consistent. And either use images with similar color schemes or photos in black and white. It makes it more elegant and put together that way. I hope that helps you! 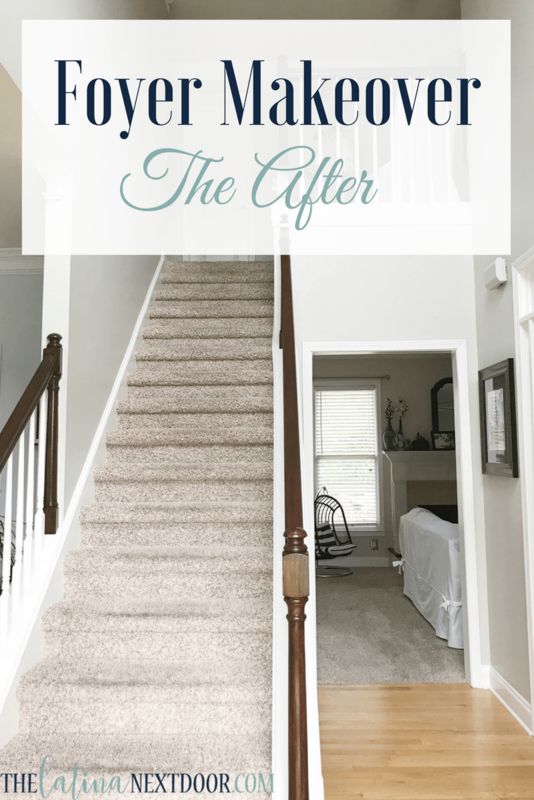 Your foyer looks amazing! Where did you get the black artwork that hangs above your door? Did you ever find a new light fixture? I’m looking for ideas, and you have great style! Thank you! The wrought iron piece above the door is from Hobby Lobby. I believe you may still be able to purchase it there. I never purchased a new light fixture because we sold that house and are now updating our “new to us” house. I have already started sharing my transformations and hope to share more very soon! Thank you for your sweet compliment! Thanks for getting back to me! Your old foyer inspired me to do some updating to ours this weekend! I actually ordered a large globe/orb fixture for our open foyer! I look forward to following your transformations!